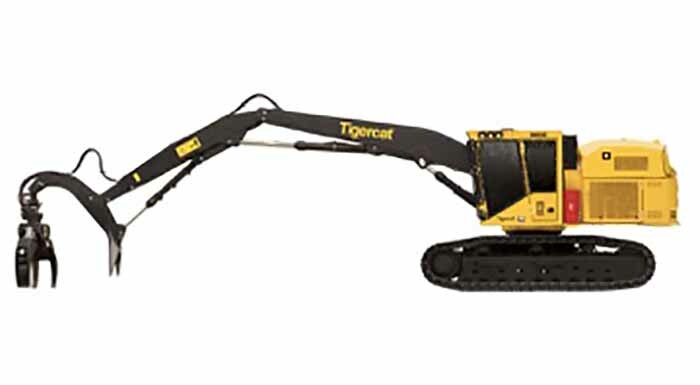 The Tigercat S855E shovel logger is a multi-purpose machine designed to improve the efficiency and productivity of the entire harvesting system. The S855E shovel logger is a quick, nimble and powerful carrier suited to felling, pre-bunching and shovel logging. The S855E can be equipped with a grapple or the Tigercat 5195 directional felling head for felling or shovel logging with one machine. The S855E can cost effectively forward wood to roadside up to distances of 80-100 m. It can be strategically located in parts of the cut block to forward trees to the skidder or fell and bunch for a yarding system. It can also organize stems and decks for the processor at roadside, improving both skidder and processor productivity. Unlike excavator-based shovel loggers with add-on forestry packages, the S855E is purpose-built for heavy duty forestry applications. The efficient hydraulic system is optimized for shovel logging and felling with a bar saw head.